Manufactured with a 24mm diameter, there is no other stainless steel rope in our 18×7 line up which can match this product when it comes to WLL or breaking force. 24mm 18×7 Stainless Steel Wire Rope also manages to remain flexible and capable of meeting diverse needs. Wire rope should not only be chosen because of its load capacity, but it remains a highly important variable to think about when choosing the right type. This 24mm 18×7 rope can be burdened with a little over 30 tonnes before it hits its safe limit. Likewise the 297kN breaking force makes it a worthy competitor to other stainless steel rope of a similar thickness. 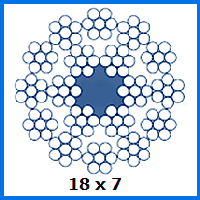 Our 24mm 6×36 rope is very comparable, for example, yet does not provide the low abrasion benefits of this strand configuration. Stainless steel is used in many places, from domestic kitchens to commercial maritime operations. It will not rust and so stays free from imperfections when it comes in contact with moisture. With this in mind, you can choose stainless steel rope like this to complete various projects. Balustrades, bespoke lifting assemblies and other creations benefit from its ability to shrug off exposure to the elements. Our sales hotline can be reached on 01384 78004 and you can call if you want to get a quote, place an order or simply get a wire rope question answered. Emailing us is also simple and our replies tend to be sent out swiftly. 24mm 18x7 Stainless Steel Wire Rope Overall rating: 5 out of 5 based on 6 reviews.